Hey, didja hear about those scientifically illiterate Americans? People so dumb, they think the sun revolves around the Earth? People who can’t pass a quiz of basic science facts? People who are getting dumber and whose lack of knowledge leads them to have misguided opinions about science policy? If you’ve somehow missed those stories, you’re likely to see some similar to them Thursday, as journalists and scientists react to the latest Pew Research survey on Americans’ general scientific knowledge. At a quick glance, the data appear to show that this country has, at best, a so-so relationship with science facts. But the researchers who conducted that survey, as well as outside scientists who study American scientific knowledge, say that’s not the right takeaway. In reality, Americans have pretty decent scientific literacy. What’s more, even if more of us did score better on quizzes of science facts, that wouldn’t necessarily result in any changes in our beliefs about science. 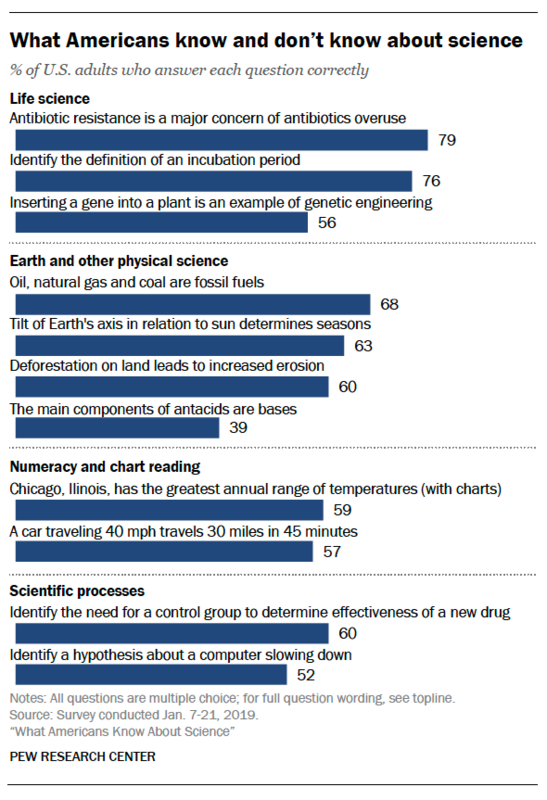 The Pew results show that a majority of Americans can correctly answer 10 of 11 specific questions about science, some of which require using charts or employing an understanding of the scientific process. The only question a majority of Americans answered incorrectly: only 39 percent of Americans knew antacids were made up of bases. When 60 percent of Americans can correctly identify the need for a control group in drug development research, I can’t consider my compatriots a group that’s scientifically illiterate. You can see a more complete rundown of the questions and correct rates in the chart below, taken from the Pew report. Pew isn’t the only organization that does these kinds of surveys. University of Michigan political scientist Jon Miller and the National Science Foundation have, separately, run similar polls going back decades. And all three sets of data — Pew’s, Miller’s and NSF — suggest that our national grasp of scientific fact isn’t too shabby. “I think we actually do really well,” Miller said about Americans’ science knowledge. His surveys, which aim to assess how many Americans can easily read and understand public science communication of the sort found in the New York Times or PBS documentaries, have found that scientific literacy actually increased in this country over the last 30 years. Granted, that means we’ve gone from about 10 percent of Americans passing Miller’s tests to 28 percent. But, he said, most people don’t delve into the subtleties of scientific facts and concepts in their daily lives. Basically, Americans aren’t dumb. Even the people with the least formal education — who are at a disadvantage in these polls — can still accurately identify nuanced aspects of the scientific method at rates higher than 50 percent. The data from the National Science Foundation surveys support similar conclusions, said John Besley, a Michigan State professor of public relations who works with the National Academies of Sciences on science literacy and public perception of science. That’s because these surveys aren’t elaborate pub trivia. Instead, both Pew and NSF conduct them partly as a way of learning more about how differing levels of scientific knowledge correlate with attitudes and beliefs about science. They want to find out whether people like Neil DeGrasse Tyson are right when they blame scientific illiteracy for problems like disbelief in climate change. “And interesting thing about that,” Besley said. “Turns out the relationship between what people know about science and their attitudes about science … is pretty small.” That is to say, Americans who know more science facts don’t necessarily hold the science policy beliefs actual scientists would prefer, nor do Americans who know the least have the least trust in science. And despite very different ideologies on a number of scientific issues, Republicans and Democrats score about the same on the Pew survey. What’s more, Besley said, experiments that tried to change a belief about a science topic by increasing people’s science education have largely failed. “Scientists buy heavily into this argument that to know us is to love us,” said Sharon Dunwoody, professor of mass communications at the University of Wisconsin-Madison. But that just isn’t backed up by empirical evidence. The problem with scientific literacy surveys, she and Besley told me, is that they’re often being interpreted by people who are starting from a couple of inaccurate premises: That everyone ought to know a wide variety of science facts, even if those facts don’t affect everyday life; and that the more science facts people know, the friendlier they’ll be toward science. Neither are true, they said. And, ironically, pushing those incorrect beliefs — and the resulting conclusion that Americans are scientifically illiterate — could actually make people less science friendly.